The game mode differs significantly between the commander, officers and ordinary members of a squadron. Commanders and officers are able to choose which operations their squadrons will participate in, move forces in real time on the operational map, and initiate battles. But soldiers are called upon to make a decisive contribution to the battles in World War operations. To access World War mode, you need to purchase at least one rank III unit for any country. 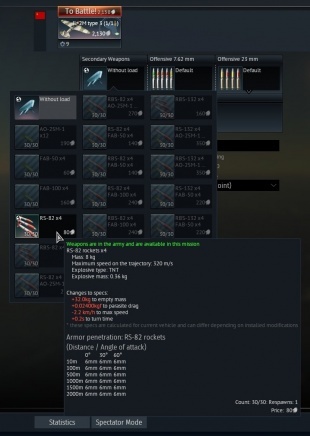 In the World War matches, RB game mode will be used with the marker mechanics of AB mode. To take part in the battles of one particular operation and monitor the progress of your chosen side on a tactical map - you can join this operation and only play in its battles. A list of all battles in the selected operation are available by clicking the "Battles" button. 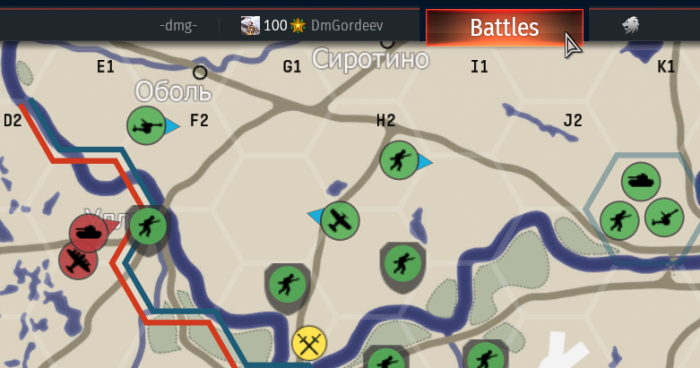 In addition, you can select a suitable battle on the operation map - just click on it and the list of battles with the focus on this operation will open. In the battle, only the units available to the armies participating can be used. Depending on the mission type, some of the army equipment may not be available to players and be instead controlled by AI. Any units lost is recorded in the army loss, regardless of what control (players or AI) it was lost in. If the available units ends right during the battle, it will be impossible to continually revive the players of this army. Important! You can take part in World War battles without having the available units for this battle! If you have units that can be used in this battle which are not in slots, you will be issued with vehicles without modifications and untrained crew. 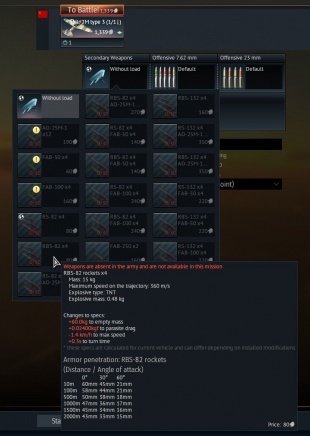 Thus, the tank will not be able to use the Parts repair and FPE modifications, and aircraft will only have the default weapon and ammunition available. The models of vehicle which you will get in battle (from the army pool of course) will come from the random draw. Also, it may be a wise idea to setup all vehicles that will be participate in the next battle in slots before launch. This move will guarantee that you will get your own vehicles from the hangar, no matter of draw results. Without the global icon, with a number after designation - this means that the given vehicle coincided with your own vehicle set in the crew slots. This is the best option of all. The number in parentheses indicates the available numbers of runs on this vehicle for the battle. With the global icon and number after designation - this means that given vehicle does not coincide with vehicles in the crew slots and can be used only with stock modifications and crews. The number in parentheses indicates the available numbers of runs on this vehicle for the battle. 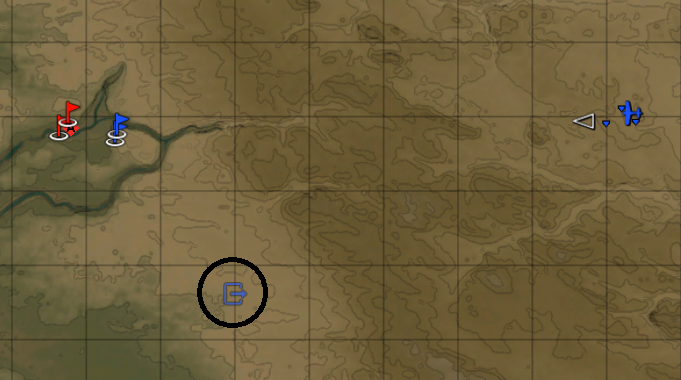 With the star icon without any numbers - this means that one of your vehicles from the crew slots was not received during the draw, but still can be used for your personal spawn points. 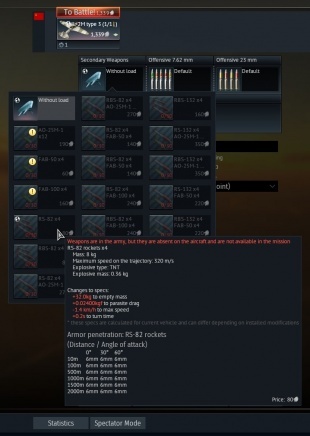 This option will be available only in battles which have a proper conditions, so don't rely on it too much. Without the global icon, but unavailable with a zero after designation - this means that one of your vehicles from the crew slots was not received during the draw and can't be used in this match. This option shows only the vehicles from the army pool, so any random units from your crew slots will not litter your spawn line. Additionally, we should mention about choosing the aircraft payloads in World War mode. Before every mission the commander can choose the appropriate type of payload personally. In the coming battle, only this type of payload other than the default one will be available for players to choose. To use this chosen payload, players must have it unlocked and installed on their plane (and don't forget about the ammo). In other cases, only the default payload will be available for players. The best option of all. Player have the right payload which was chosen by commander. Go ahead and show no mercy to the enemy! The commander chose a payload, but for some reason the player doesn't have it. Well, something has gones wrong and as a result your abilities in battle has been greatly decreased. Except for the default or chosen payloads, all other options are unusable. The high command will not accept arbitrariness! In the World War mode, a respawn mode is used which reflects the clash of armies. Armies have a limited set of units available for participation in battles and this units are distributed among players randomly. At any one time, the player is available to respawn one or more units, randomly selected from the list of available units in the army, and the probability of obtaining a particular model depends on its number and type of battle. For example, protecting the allied tank convoy from an air raid, players will always have access to SPAA, despite the presence of a large number of tanks in the army. The available units and its quantity are distributed among the players of the regiment. If the player chooses the available units for respawn, the other members of the squad or regiment will be able to leave for the remainder. The next unit you can take can only happen 60 seconds after respawning with the previous one. This page was last edited on 18 November 2018, at 07:00.